Cutnell and Johnson has been the #1 text in the algebra-based physics market for almost 20 years. PHYSICS 9e continues that tradition by providing superior support students need to facilitate a deeper level of conceptual understanding, improve their reasoning skills and see the relevance of physics to their lives and future careers. Research studies have shown that there is a strong correlation between time on task and student learning gains. PHYSICS 9e with WileyPLUS offers instructors innovative new tools for engaging students. Through the use of a proven pedagogy that includes integrated reading activities, instructors are able to much more effectively monitor student reading and progress, resulting in a higher level of student engagement with the course content. Success in physics is also based on practice. Working high quality problem sets is one of the best ways for students to learn physics. However, to get the greatest benefit from working problems students need immediate feedback and expert coaching. PHYSICS 9e with WileyPLUS offers an extensive and tested set of assessment questions and sophisticated wrong answer feedback. Access to WileyPLUS not included with this textbook. 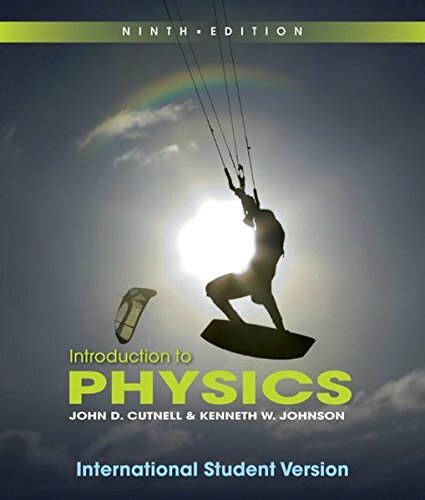 This text features: Tools that help students develop a conceptual understanding of physics: Conceptual Examples, Concepts & Calculations, Focus on Concepts homework material, Check Your Understanding questions, Concept Simulations (an online feature), Concepts at a Glance (available on the instructor companion site). Features that help students improve their ability to reason in an organized and mathematically correct manner: Explicit reasoning steps in all examples, Reasoning Strategies for solving certain classes of problems, Analyzing Multiple-Concept Problems, homework problems with associated Guided Online (GO) Tutorials, Interactive LearningWare (an online feature), Interactive Solutions (an online features) Examples that show students the relevance of physics to their lives: a wide range of applications from everyday physics to modern technology to biomedical applications. There is extensive support for premed and biomedical students including biomedical applications in the text and end of chapter problems marked with a caduceus, practice MCAT exams, and a supplemental book of biomedical applications.